Indian Raja – really the only place to go in Riga for authentic, good Indian food. For those of you who like spicy food, you’re in luck! Now Indian Raja – really the only place to go in Riga for authentic, good Indian food – has two locations to serve you better. In addition to the usual Old Town venue, on Vecpilsetas iela, they have also opened a second branch just down the street, on Skārņu, right behind St. Peter’s Church. 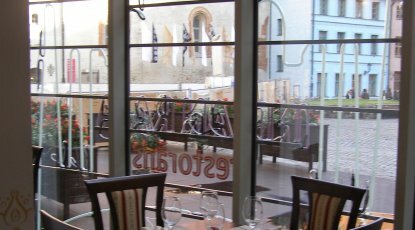 For those who might not enjoy dining in the cozy Vecpilsētas basement, the new location is set in a sort-of glass house, providing gorgeous views of the nearby Old Town. In summer, their capacity will expand as they offer outdoor dining on the locale’s ample terrace. Although you can surely count on the same high quality of Northern Indian fare here, the intention is also to offer some specials that are not available anywhere else, such as their new “sizzlers.” These are meals such as Chicken Tikka served to you hot, steaming and sizzling in a special pan (€12.00). Although some may consider this place a bit pricey (most main courses range from €10-17, and the portion of rice is extra), this is one of those places where you won’t be disappointed – you get more than what you pay for in terms of quality, authenticity, and also friendly service.